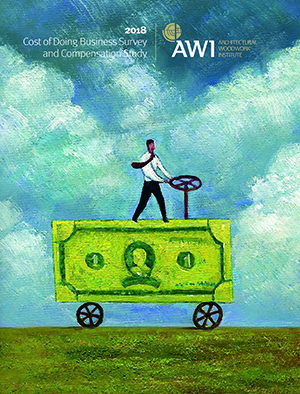 AWI's annual survey designed as a tool to guide owners and key managers to help improve their profits with direct comparisons from companies working in the same industry and region. The Cost of Doing Business Study and Compensation Report includes detailed revenue and expense line items, staffing levels, operational procedures and productivity measures to help companies measure the performance of their business and uncover areas of strength and opportunities for improvement. The CODB provides your company the opportunity to compare your financial performance with the best in the industry. In today’s increasingly competitive business climate, a company’s compensation and benefits policies have become a vital tool in attracting and retaining quality employees. The AWI Compensation Study allows you to compare compensation levels and benefits offerings with up-to-date industry standards and to increase profitability by getting a handle on payroll costs. The Cost of Doing Business Survey is available for all current AWI Manufacturing Member Companies. All AWI Manufacturing Members who completed the survey will receive a full copy of the book. All other members can download a copy of the CODBS Executive Summary in the Members Only Portal or click here to purchase a full copy. You will be asked to login using your Company Name, your User Name (we use your Email Address) and a secure Password that was generated for you by Inverra. Remember, access is only available to your company's primary contact.